Lt. Governor Tina Smith honored state employees from MDH and other agencies on January 14, for their work on eight different projects that have greatly improved services for Minnesota residents and businesses. The Department of Health, Office of Vital Records (OVR) was among those recognized. OVR received the Governor's Continuous Improvement award for its Death Data Delivery Project, which was a quality improvement effort to enhance the quality of death record data and its availability for families, public health, and others. Provide preliminary death data to local public health within one week, rather than waiting up to 22 months for finalized data. Pictured from left to right: Maria Schaff, Molly Crawford, Heidi Granlund, Kirsti Taipale, Gloria Haluptzok, Roberta Geiselhart (Hennepin County Medical Examiner’s Office), Tina Smith Lt. Governor, Karen Welle, Gil Acevedo, Otto Hiller. Not all Minnesota Death Data Delivery project members are pictured. February is National Heart month and a reason to take a closer look at heart-related deaths. Nationwide, heart disease is still the leading cause of death, just ahead of cancer. 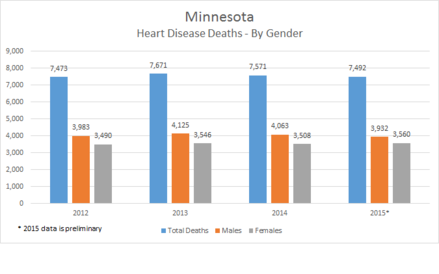 In Minnesota, cardiovascular disease, including coronary heart disease and stroke, is the second leading cause of death behind cancer. Heart disease is heartless. It strikes without warning. Many of us live with, or know someone affected by heart disease, stroke or a cardiovascular condition. Cardiovascular disease — including heart disease, stroke, and high blood pressure — is responsible for one out of every three deaths. The American Heart Association set a goal to improve the cardiovascular health of all Americans, and reduce deaths from cardiovascular diseases and stroke, by 20 percent by the year 2020. One way the American Heart Association will know that their goal has been achieved is through national mortality data derived from cause of death information provided by physicians. The Minnesota Department of Health supports the mission to improve cardiovascular health and reduce the burden of heart disease and stroke for all people living in Minnesota. Good news--Minnesota shows a decrease in the percentage of heart-related deaths over the last two years. Heart disease includes a number of conditions which affect blood flow to, and functioning of, the heart. The most common type of heart disease is coronary artery disease (CAD), also known as coronary heart disease (CHD) which may lead to atherosclerosis. A heart attack, also known as a myocardial infarction, occurs when the vessels supplying blood to the heart become blocked. Heart muscle tissue is deprived of oxygen, resulting in tissue death. Heart attacks most often occur as a result of CAD. Spasms occurring in coronary arteries also cause heart attacks. Heart attacks can be associated with or lead to severe health problems such as heart failure and life-threatening arrhythmias. Cause of death information from death certificates is the primary source of state and national mortality statistics. Data about deaths is used to determine which medical conditions receive research and development funding, set public health goals, and measure health status at local, state, national, and international levels, so accuracy and specificity are important. For these reasons and as a service to families, it is important that heart-related cause of death statements explain the disease sequence that resulted in the condition that caused the death. The Office of Vital Records sends files of death records to the National Center for Health Statistics (NCHS). NCHS uses an automated method to assign International Classification of Diseases Codes to the conditions reported by physicians on death records. The coded records are returned to the Minnesota Department of Health (MDH) the same day. Coded data is then made available to local public health, researchers, and other state government agencies for many uses, including disease surveillance and monitoring trends (e.g., infectious diseases and drug overdose deaths). Some records cannot be auto-coded because of formatting or punctuation issues. Commas and semi-colons are acceptable forms of punctuation; however, the use of unacceptable formatting or punctuation causes records to be rejected from the automated system and set aside to be coded manually. This delays the return of records to MDH and sharing of the coded data. The Minnesota Medical Association invited State Registrar Molly Crawford to contribute an article to their January-February 2016 issue of Minnesota Medicine. Read the commentary, “We need to end the paper trail—Why all physicians need to use the state’s electronic system for registering births and deaths” on the Minnesota Medicine website. Fairview University Medical Center - Mesabi is hosting a special community engagement class focused on unmarried parents and their options for establishing paternity during the birth registration process. A brief overview of the paternity laws and birth registration process will be followed by discussion. Thursday, February 25, 2-4 p.m., Fairview University Medical Center- Mesabi, Hibbing, MN. Space is limited; email health.MRCAdmin@state.mn.us to reserve a seat. Include HIBBING in the subject line. Information specific to the class will be emailed when registration is confirmed. Closed Monday, February 15, 2016 for President's Day. Tuesday, February 16, 2016: Office of Vital Records All Staff Meeting, 8:15 a.m. - 9:45 a.m. Calls will be returned after the meeting. County offices, please report and submit your 2015 annual marriage license counts here: Annual Report of Marriage Licenses Issued. Counts are due by February 29, 2016. Age is the most significant risk factor of developing heart disease, followed by gender, family history coupled with ethnic background, smoking, obesity, lack of exercise, high blood pressure, diabetes, and high blood cholesterol. Morning is the “witching hour” for heart attacks. Mornings are when most people suffer a heart attack. In the morning, stress hormones, such as cortisol and adrenaline peak. Additionally, blood is thicker and harder to pump because a person is partially dehydrated. The incidence of heart attack was 20 percent higher in men and 15 percent higher in women on Mondays according to one study published in the European Journal of Epidemiology. OVR recommends that those who are new to registering births or have never been formally trained, attend Birth Registration 101. The class incorporates presentations from subject-matter experts with MR&C hands-on practice and discussion. More information about the class is on the MDH Birth Registration Information page. You can update or cancel your subscription at any time by editing your personal profile. All you will need are your e-mail address and your password (if you have selected one). P.S. If you have any questions or problems please contact subscriberhelp.govdelivery.com for assistance.